I have a problem. And I’ve given up hope of recovery. Instead, I’ve embraced it. It’s part of who I am. At the national Romance Writers of America conference in San Antonio, I received easily two dozen free books and I also purchased a couple. I already have over 100 books in my To Be Read stack (Mt. TBR). While on the road, I read a couple of reviews of a book, The Divorce Papers. It sounded like something I’d enjoy. Did I make a note of that book for future reference and open up one of my new books? I requested The Divorce Papers from the library. I really enjoyed this one. It’s literate and entertaining and really well written. 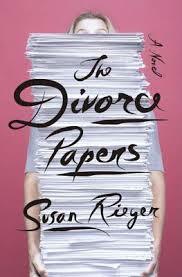 The Divorce Papers is an epistolary novel. Mia and Daniel Durkheim’s divorce story is told through memo’s, e-mails, legal filings, informal notes, and various other written forms. Mia’s attorney is Sophie Diehl, a young associate at an old firm in the fictional town and fictional state of New Salem, Narragansett. Sophie is a criminal defense lawyer who gets roped into taking on the divorce. As Sophie learns the ins and outs of civil and matrimonial law, her client Mia also learns who she is and what she really wants and expects from life. The short answer is her daughter Jane. Both Sophie and Mia are fully realized characters who step off the pages of their notes and letters and take on new lives in my head. The Divorce Papers is an excellent book and I’m glad I skipped over Mt. TBR and put it on top.